(In between University & Railway station) 227741, 230206. This heritage hotel is located on the outskirts of Karaikudi with rooms that are well furnished and having all modern facilities. The in-house restaurant serves original Chettinad cuisine in addition to multi cuisine dishes. Great effort brother, but you missed Hotel Chidambaravilas, one of the best Hotel in Karaikudi. http://www.chidambaravilas.com/. Please add it.. Thank You.. Awesome hotel list you have. In Karaikudi I stayed in Hotel Chidambaravilas this week and I would say this hotel was wonderful and exceeded my expectations. Everything was very well organized here and their breakfast, lunch and dinner was very good. Rooms were wonderful couldn't get any better once you were on that bed I promise you felt not to get up at all. The office staffs, front office executives and cleaning staffs are very friendly. 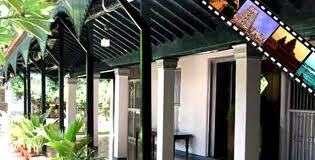 This hotel has a great location (Karaikudi), comfortable rooms, very nice swimming pool and very tasty foods. I would suggest hotel Chidambaravilas in Karaikudi to everyone.I can't wait to visit again.